Buying toothpaste was once a fairly simple process. Today the shelves contain a variety of flavor and formulas designed to do everything from protecting your teeth from tartar to brightening a slightly dimmer smile. While it’s tempting to think one brand as good as another, your Seaside family dentist wants to help our patients determine the right toothpaste for their individual oral health. So you have a better idea of what brand to buy the next time you walk down the toothpaste aisle, here’s a guide to what brand best meets your needs. Teeth whitening has quickly become the most popular cosmetic dental procedure performed by dentists across the U.S. For those who don’t want to pay for professional treatments, whitening toothpaste offers an affordable alternative for removing stains. While professional whitening treatments use powerful compounds that help to strip tooth enamel of stains, whitening toothpastes work to remove stains by scrubbing them away from the surface of your teeth. To achieve this effect, whitening toothpastes contain abrasive agents that could potentially irritate your teeth and gums. If you suffer from gum inflammation, sensitive teeth or gum recession, the abrasive agents in a whitening toothpaste may actually do more harm to your long-term oral health than good. 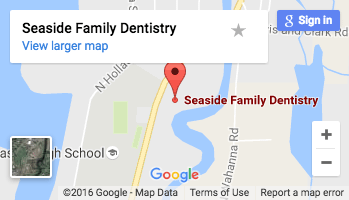 To determine whether your teeth and gums are healthy enough to use a whitening toothpaste, schedule an appointment with your Seaside family dentist, Dr. Scott Santos at Seaside Family Dentistry, for an oral health exam. Plaque – a sticky biofilm that clings to the surface of our teeth – produces harmful substances that can slowly erode away the surface of your teeth known as enamel. When left on your teeth, plaque hardens into tartar, a yellowish substance that discolors teeth and increases the risk of gum inflammation and disease. Once tartar forms on the surface of your teeth and along the gum line, it can only be removed during a professional cleaning. However, if tartar buildup is a problem you frequently experience – an easy indication is how often your teeth get scraped during dental cleanings – you may want to consider switching to a toothpaste that features tartar protection. While these brands won’t remove the tartar currently clinging to your teeth, their special formula works to decrease plaque’s tartar forming properties. In other words, the more the you brush with this type of toothpaste, the less likely plaque will harden into tartar. If you suffer from frequent cavities, you should consider protecting your oral health with a cavity prevention brand of toothpaste. These brands don’t contain any special ingredient other than a higher concentration of fluoride. Fluoride has long been associated with preventing tooth decay that leads to the development of cavities. That’s because fluoride helps to remineralize teeth, a process that replaces the minerals plaque typically strips from tooth enamel. By making tooth enamel stronger, fluoride works to prevent the effects of tooth decay so your teeth stay healthier. Finally, if you suffer from sensitivity to hot or cold foods and drinks, this type of toothpaste may be right for you. Tooth sensitivity occurs when the delicate roots of your teeth become exposed, typically due to gum recession. Toothpaste designed to treat sensitive teeth work by helping to numb the roots of your teeth so they are less irritated by the things you consume. While these types of toothpaste may help to alleviate discomfort, the underlying cause of the condition – exposed tooth roots – could progress into a much more serious issue. Early stage gum recession is easily treatable by Dr. Santos as long as the condition is caught early on. If you suffer from pain whenever consuming hot or cold foods, make an appointment for an oral exam. The type of toothpaste you should buy really depends on your current oral health. However, no matter what brand you buy, make sure the label features the ADA seal of approval and that the ingredient list includes fluoride. Once you have the right brand for you, make sure to brush at least twice a day for two minutes a time.